Ideas don’t have to be profitable or business focused to be good. The Best Fun Hack award goes to the project that brought joy to judges and fellow hackers alike. It could be a game, robot, anything that’s fun! We live in a regional location and face challenges in increasing our embrace of technology and automation, our community will benefit from talented people who can introduce ideas with commercial potential. From our Learners Stream - the individual who showed the most enthusiasm, worked the hardest, and tried to helped others. A weekend hackathon competition where teams of designers, developers, tinkerers and thinkers get together to build something from start to finish in just 2 days. Creations should be technology focused but can be digital like apps and software or physical products. Ticket costs are to cover lunch, snacks, coffee and pizza. 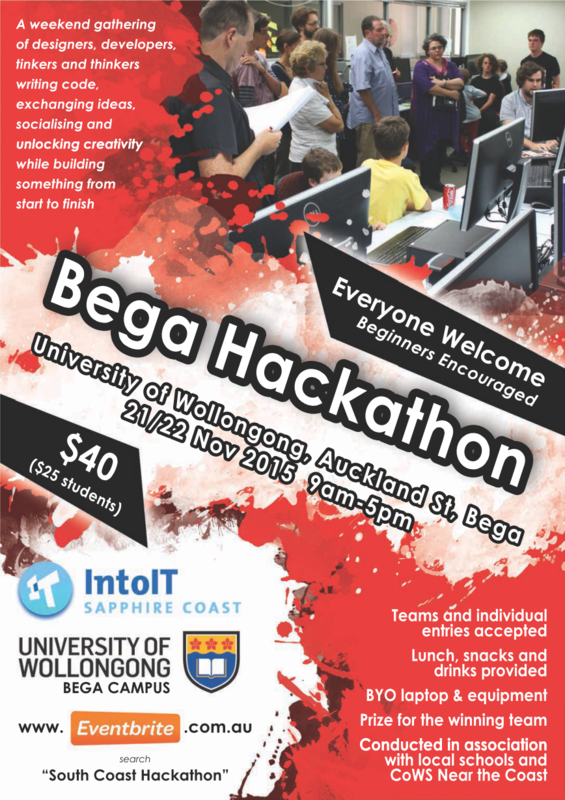 The event is organised by volunteers and local tech entrepreneurs with a view to encourage the formation of a startup and maker culture within the Bega Valley shire, as an outlet for creative individuals and as experience for the local tech community to showcase their skills. Greater information about submission requirements will be provided during the early part of the Hackathon. Did you communicate your idea well to the judges? How revolutionary and ground-breaking is the project within its sector? Amongst other solutions to similar problems, how cool is the hack and how well does it solve the problem? How well have you identified and/or addressed a commercial opportunity. Does the hack stack up against commercial alternatives, but have some advantage given some refinement? Does it represent an untapped commercial opportunity?